At the end of March, the SoxProspects Staff made their annual trip to Minor League Spring Training. Over the next few weeks, their notes and observations will be featured on SoxProspects News. Here is the first edition of Notes from the Field from Spring Training 2018. 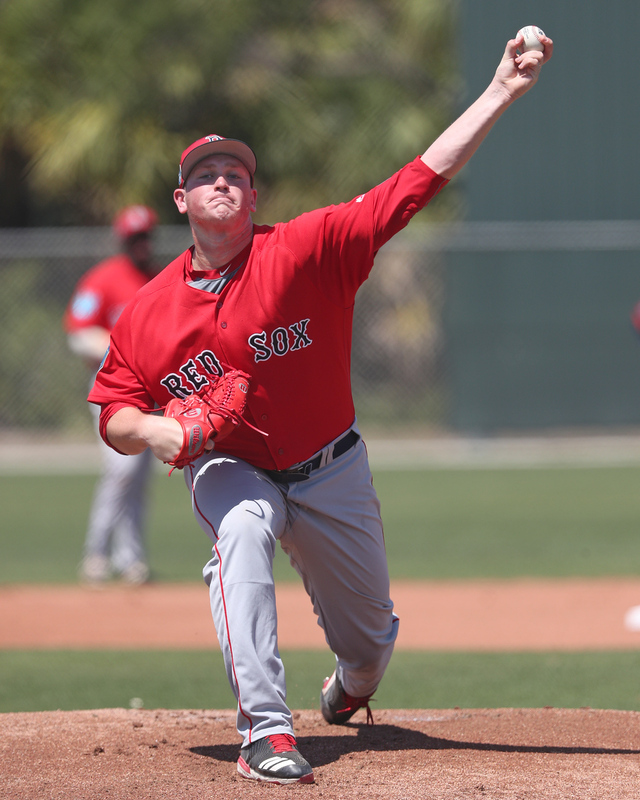 FORT MYERS, Fla. -- The top prospect in the Red Sox system, left-hander Jay Groome did not disappoint over his three innings of work for Low-A Greenville showing off better stuff compared to last season and overwhelming the Twins hitters. Overall, Groome struck out six over his three innings of work, allowing one hit and walking two. The impact of Groome’s offseason workout program, which included training with Chris Sale, was noticeable, as he looked in better shape compared to this time last year. He already has a large pitcher’s frame, especially for a nineteen-year-old, and will always have to watch his conditioning, so it was encouraging that he focused on this area over the off-season. Groome’s delivery was the same as past looks and he did a good job repeating it for the most part. He did lose his mechanics a few times, which impacted his control and led to a pair of walks. Both times, however, he righted the ship and struck out the next hitter. Groome came out strong, sitting 94-96 mph for the first two batters before dropping to 91-93 mph when he had to pitch from the stretch. This drop in velocity from the stretch held throughout—even in his third inning of work, he was still hitting 95 from the windup but never got higher than 93 with a runner on base. Groome’s command was better at lower velocities, but it was good to see him coming out with more velocity and able to reach back for more if he wanted to. Groome’s fastball overwhelmed the Low A hitters, and he got seven swinging strikes with it across 12 batters faced. Consistent fastball command will be key for Groome’s development going forward, and it will be interesting to see if he can harness the pitch at higher velocities or if he tends to sit at one velocity with the ability to reach back for more when ahead in the count. Groome mixed in both his curveball and changeup, with the former still well ahead of the latter. Groome threw his curve 80-85 mph, with the majority in the 80-82 mph range. He snapped off a couple well-above-average ones, including a backdoor breaking ball to a right-hander for a strikeout looking that followed a swinging strike on a curveball for strike two. The pitch showed tight rotation, 1-to-7 shape, and excellent depth through the zone. He does a good job snapping off the pitch and can either throw it for strikes or bury it down and out of the zone. Groome’s changeup was inconsistent but flashed average potential. He threw it 84-86 mph with deceptive arm speed, but the pitch lacked movement. Coming in, it looked like a fastball, but kept the hitters off balance because of the separation in velocity. He was throwing the pitch considerably harder than he threw it last season (80-83 mph), so he is definitely still developing a feel for the pitch. This type of strong performance from Groome was reportedly the norm throughout Spring Training, but unfortunately, he will start the season the disabled list in Greenville after suffering a mild flexor strain, according to Alex Speier. Groome struggled through injuries last season, with this same one ending his season early in August. It is somewhat concerning that he seems to be continuing to suffer muscle strains like these and the lat strain that cost him most of 2017’s first half, so this bears watching going forward, especially given his high-maintenance frame.